Standup paddleboarding has grown rapidly in popularity over the last decade or so. It’s a great, low impact activity that can help to improve your balance and reduce overall stress levels. 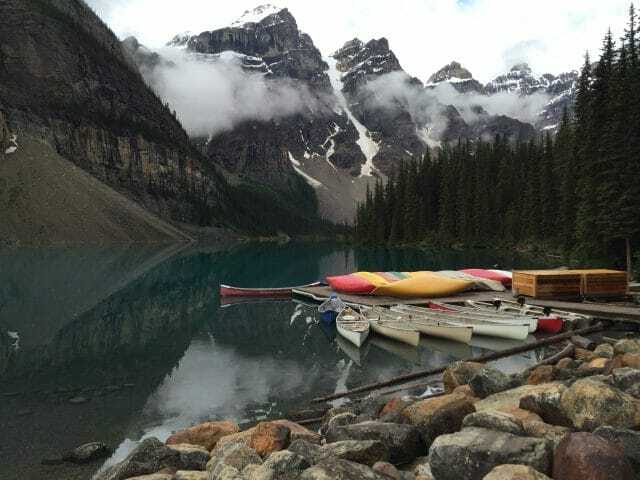 It’s hard to feel stressed when you’re paddling gently through calm waters and enjoying the sunshine on your face. If you’re interested in getting in on the fun, you’ll need to get your own paddleboard. Fortunately, many starter models are very affordable, but transporting a board can be difficult depending on the type of vehicle you have. That’s one area where inflatables come in handy. 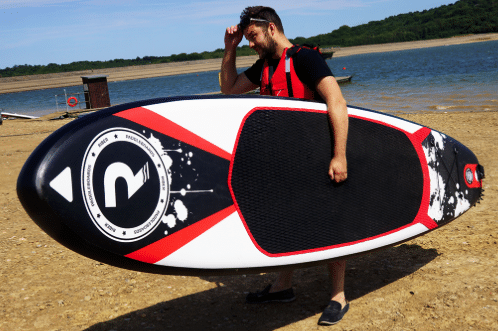 In this article, we’ll explore five benefits of an inflatable SUP. 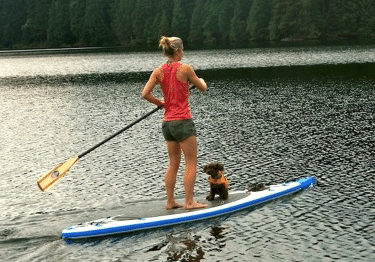 Getting an inflatable SUP to and from the water is much easier than with a rigid SUP. Because the board deflates when not in use, you can easily toss it into the back of your car to transport to your favorite waterway. Once there, most inflatable SUPs can be inflated using an included pump that will run off your car’s 12V (cigarette lighter) connection. 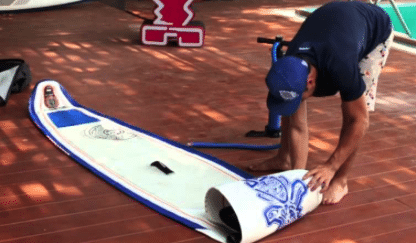 Most of these SUPs can be fully inflated in a matter of minutes and include a handle in the mid-section of the board to make carrying it easy. 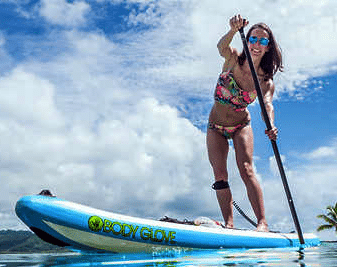 Additionally, inflatable SUPs typically offer more stability than more rigid counterparts, which makes them a great option for anyone looking to learn how to paddleboard without much previous experience. As I briefly mentioned in the previous section, most inflatable SUPs will include a handle in the middle to make carrying them very easy. Another factor working in your favor is that they are considerably lighter than rigid SUPs. One person using just one arm can easily carry most inflatable SUPs. This frees you up to bring your other gear along and only have to make one trip from your car to the water’s edge. The precise weights of different inflatable models will vary from about 15 pounds up to almost 35 pounds. Most also come with a backpack-style carry bag, which makes them even easier to carry when deflated. For those that want to bring their inflatable along on a short backpacking trip to an alpine lake, the backpack carry bag makes that possible. Other models actually come in a bag with wheels, so that it could be rolled to your desired destination. This is arguably the #1 thing that people worry about when it comes to inflatable SUPs. 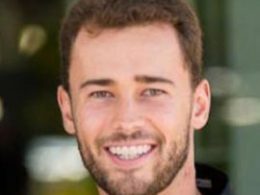 Will they provide enough support so that I can actually do the stand up part of stand up paddleboarding? Fortunately, the answer is yes, but with one important caveat. Inflatable SUPs must be inflated to the proper PSI (pounds per square inch) in order to provide the type of rigid support you’re looking for. They are all designed to withstand that maximum PSI and, as I mentioned earlier, can actually be more rigid than non-inflatables when pumped up properly. Most folks are actually shocked at just how firm an inflatable SUP is once inflated to the recommended PSI. With just a passing glance, some inflatables are even hard to differentiate from rigid SUPs. But, on the same token, inflatable SUPs are much more forgiving if you happen to fall and hit the board. They also provide a softer surface for beginners starting out on their knees, or for yogis executing tree pose amidst the gentle rocking of the waves. When you’re not using a rigid SUP, you’ll need to find a space in your garage or underneath your house to store it. Because most SUPS are typically in the 10 to 12-foot range (in length) this can actually require quite a bit more space than you might imagine. Most rigid SUPs won’t stand up vertically in a typical garage and can be subject to unnecessary wear and tear if you store them on their side or face down for long periods of time. 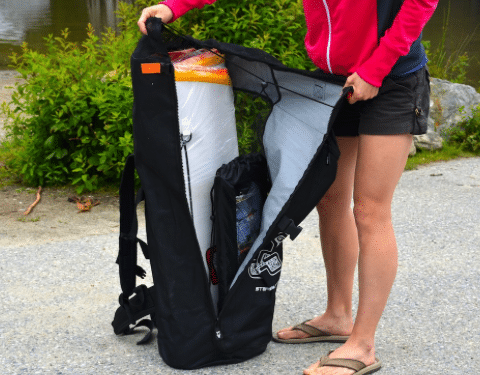 Inflatable SUPs, on the other hand, have the advantage of deflating, rolling up, and storing conveniently in their backpack carry bag. This reduces storage dimensions from something like 10’ x 3’ (depending on exact model) to something more like 3’ x 2’. As you can see, this saves you a lot of storage space. Using this quick math, you could actually store 5 inflatable SUPs in the same space that would be taken up by a single rigid SUP! This is more of a benefit of standup paddleboarding in general, but I thought it was very important to include, nonetheless. 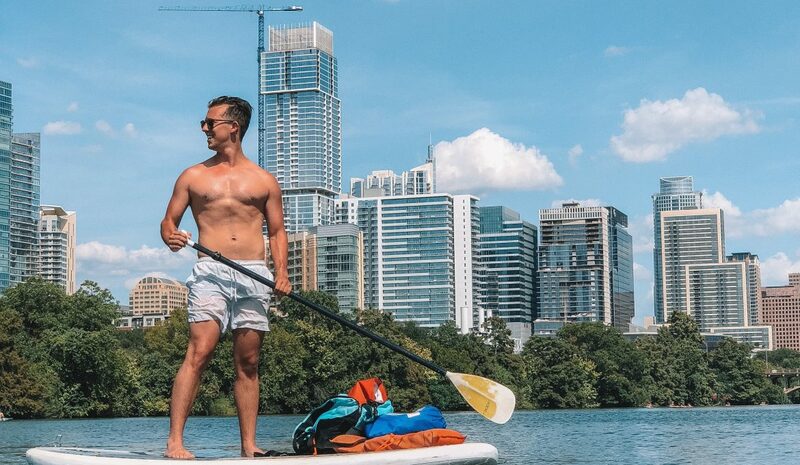 Paddleboarding is an excellent full body workout because your lower body will be activated to retain balance while your upper body works to move the board forward in the water. Most people also underestimate the importance of engaging your core when paddleboarding. 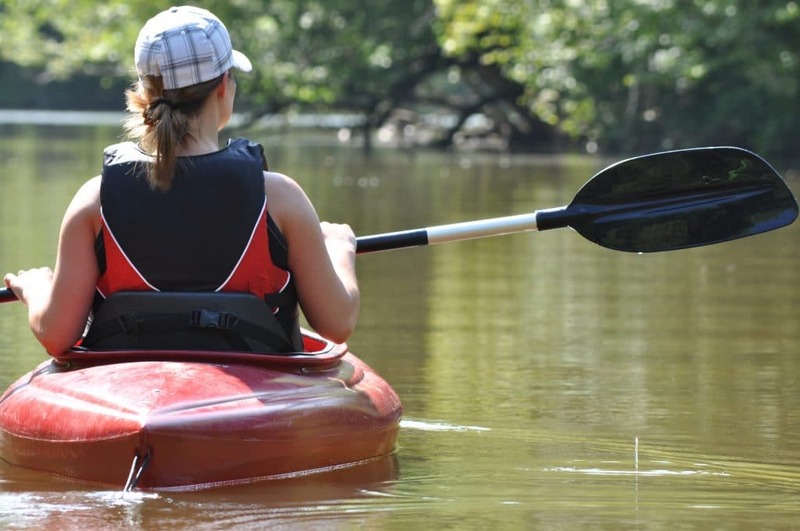 This will not only help you maintain your balance if the water gets choppy, but it will also reduce muscle fatigue in your shoulders and arms over the course of a longer paddle. 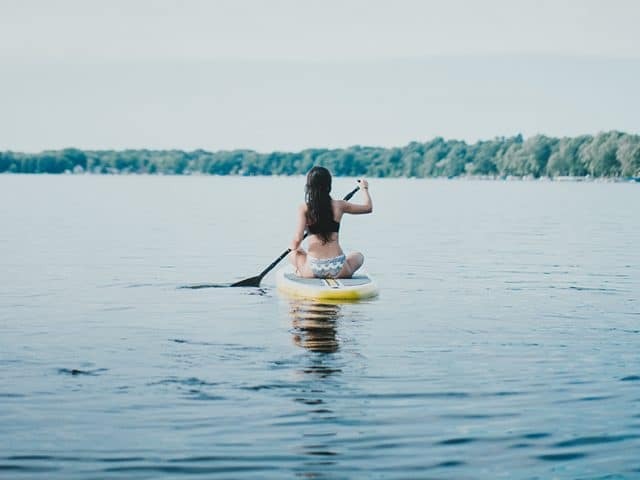 Paddleboarding also has a number of additional health benefits, including improving endurance, increasing overall strength, and assisting in the process of rehabilitating after certain injuries. If you’re interested in buying a new paddleboard, check out our selection of inflatable SUPS at Gander Outdoors! 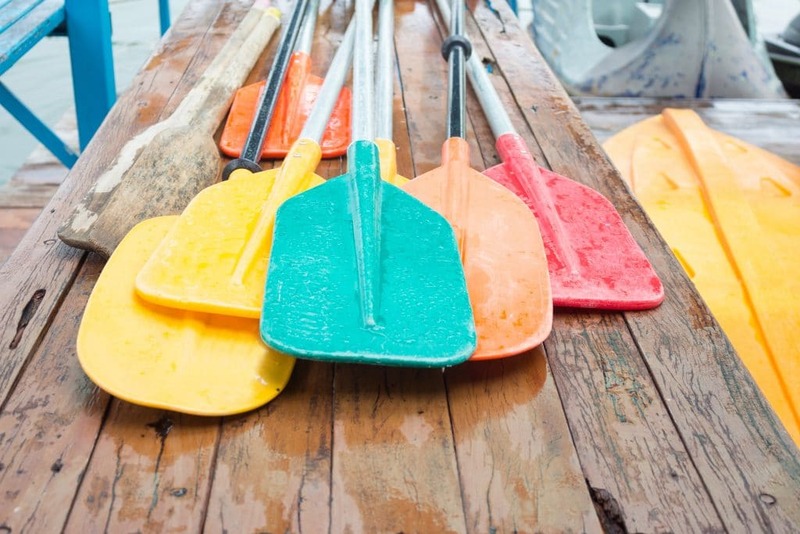 Paddleboarding vs. Kayaking: Which One is Right for You?